Is that snow, or money blowing in the air in Ontario? Are the agencies of the Ontario government doing all they can to contain electricity bill increases and costs of power generation in Ontario? The answer is “no,” and here’s why. During the first six months of 2014, the Ontario demand for electricity, according to the Independent Electricity System Operator (IESO) monthly summary sheets, was 71 terawatts (TWh). Total demand was 79.1 TWh. Looking at who generated the power shows that 40.3 Twh1 was generated by OPG (Ontario Power Generation); however ,they included 1.6 TWh generated by two jointly owned gas plants, Brighton and Portlands, making their actual production 38.7 TWh. The balance of 40.4 TWh came from OPA-contracted generators and non-utility generators (NUG). The OPA as of June 30, 2014 had contracts for 22,522 megawatts (MW) with 16,704 MW in operation and the balance under development. Coincidentally, the OPG’s quarterly report for the six months ending June 30, 2014, stated they had 16,931 MW operating, including their 50% of the two jointly owned gas plants. Extracting the 565 MW from the two gas plants puts OPG’s claimed capacity at 13,366 MW. As the two provincially owned entities had similar capacity, it is worth comparing them on generation and cost. IESO doesn’t break out the specific generation or capacity provided by NUG-contracted parties, so we estimated NUG capacity at 1650 MW (from the Association of Power Producers of Ontario/APPrO) adding it to the OPA capacity for comparison purposes. The results show OPG produced 48.9% of Total demand for the January/June period and the OPA/NUG combination produced 51.1%, despite the latter having 53% of total Ontario capacity versus the 47% held by OPG. If one looks at Ontario demand (70.1 TWh), OPG produced 54.5% of all Ontario consumption. In the six months ending June 30, 2014, Ontario exported 8.4 TWh or 10.6% of Total demand and generated revenue of $447 million for those export sales. The “bare bones” cost of that production to Ontario’s ratepayers was: Global Adjustment (GA) + Hourly Ontario Energy Price (HOEP). The cost to ratepayers in the six months for the exports was in excess of $275 million. The latter dollar amount doesn’t include costs associated with: hydro spillage, wind power generation curtailment, paying for idling gas plants, meteorological stations, conservation spending, etc. which all find their way into the GA pot. For the six months to June 30, 2014 the HOEP “weighted average” was $53.24 million per TWh. The HOEP had not seen such lofty prices in the first six months of the year since 2005 when it actually equalled the average rate levied on Ontario’s ratepayers. Nine years ago HOEP reached 6.3 cents per kWh in the first six months, equal to the average charge to ratepayers. Since then we have the GA to contend with; its “weighted average” for the first six months of 2014 was $32.65 per megawatt hour or 3.3 cents per kWh. The last time we saw the GA lower was 2010 when the weighted average was $29.30 per MWh (2.9 cents/kWh) for the six months ended June 30, 2010 and it ended the year close to that amount. Now the foregoing is not overly upsetting until you look at the total GA for the first six months of 2014 and apply it to the generation delivered by the three categories of OPG, OPA and NUG that find their way to the GA pot. To wit: The total GA reported by IESO for the first six months of 2014 was $2,159 million and OPG’s share was 2 % or $42 million, the OPA’s costs were $1,774 million (82%) and NUG contracted parties represented the remaining $343 million or 16%. Measurement of the GA generally reflects on individual costs of the generating components which feeds the claim that wind and solar costs are falling in relation to consumer based electricity costs which are rising. Consumers know those “commodity” costs increase every six months when updated by the Ontario Energy Board. It is worth noting the Bruce Nuclear contracts are in the OPA totals which considerably lower than the overall OPA costs per MW of capacity. The bulk of the costs related to the OPA are attributable to contracts with wind and solar developers, embedded and curtailed generation, conservation spending, the NRR (net revenue requirement) for idling gas plants, etc. As a consumer in Ontario my view is IESO should be doing all they can to ensure OPG’s capacity is utilized to the greatest extent possible in order to contain rate increases. Those rate increases appear to have been caused by the obvious difficulties the OPA had in negotiating generation that provides value for Ontario’s ratepayers perhaps because they simply do the bidding of the Liberal government’s energy minister regardless of the impact on consumers or the provincial economy! Merry Christmas to all and please don’t forget to renew (or join) Wind Concerns Ontario so we can keep up the fight to bring sanity back to electricity planning in the Province. OPG 2nd Quarter report 2014 on Page 2. Rounded to the nearest hundred dollars. The H.J.Heinz plant was one of the NUGs in Duguid’s directive but they left the province anyway. Parker Gallant will be on leave for the holidays, returning in the New Year. The latest report from the energy watchdog team of Parker Gallant and Scott Luft is out, with the news that November was a great month for power generation from wind … but not so great for Ontario’s ratepayers. Delving further into wind’s volatility, one need only look at IESO who have responsibility for managing the electricity grid, forecasting our power needs, and ensuring that generators are ready for any spikes or drops in power demand to prevent blackouts or brownouts. The volatility caused by wind generation has become an issue that they must now deal with and it appears to be causing them problems. This is somewhat evident if one simply looks at the daily demand at hour 17 on December 2, 2014, as wind dropped relatively quickly as demand was rising. The result was the HOEP went from $30.23 per/MWh to $643.00 per MWh from one hour to the next. The question raised by this occurrence is: was this bad planning, or volatility caused by the sun sinking (no solar output) and the wind dying down coupled with ratepayers turning on their lights? The Ontario Auditor General’s report released last week blasted the Energy Ministry for the Smart Meter debacle and then blasted them for the lack of data feeds. It now appears that we have another problem with data related to the market price found on the Independent Electricity System Operator (IESO) website as I discovered. Now, just a few days ago I reported that on hour 18 of December 4, 2014, the Hourly Ontario Electricity Price or HOEP had climbed to $986.76 (98.7 cents/kWh), so I decided to visit another IESO page that carries daily, weekly and monthly summaries. This is what the Daily Summary sheet for December 4 2014 said. The “Daily Summary” gave me hope that the posting on the “Power Data” page was simply an input error. I decided to confirm that by going to the HOEP report for December 4, 2014. Imagine my surprise when hour 18 on December 4, 2014 indicated that the peak in that hour was changed to $489.27 (48.9 cents/kWh). Here is the statistic on that hour taken directly from the report. What does this mean? The IESO (ADMIN) decided the HOEP peak for the month of December that occurred on December 4, 2014 at hour 18 no longer exists. The failed data interface in the electricity sector that the Auditor General pointed out about the “smart meters” and the “smart grid” seems to be spreading. Perhaps Bob will pick a time to sit down with me over a “Timmies” coffee and attempt to explain this one, but I sincerely believe it is too complex for him to understand, too. Recent events evolving at the Independent Electricity System Operator (IESO) should make anyone familiar with the Ontario electricity sector and IESO’s forecasting ability very nervous. December 4, 2014, at hour 18, the HOEP (Hourly Ontario Energy Price) jumped to $986.76 (98.7 cents/kWh), and earlier that week, on December 2nd it jumped to $643.00 (64.3 cents/kWh) at hour 17 (5 PM). IESO’s forecast for hour 18 on Dec. 4th was that the HOEP would be $65.00 (6.5 cents/kWh)—that forecast was way off. The latter jump was caused because Hydro-Quebec had a transmission failure and sought to import electricity from Ontario; in that hour we supplied them with 1,242 MW with a value (if we got paid the HOEP market price) of $1.2 million. Is this neighbours helping neighbours, or simply taking advantage of the circumstances? But that wasn’t the case with the December 2nd jump: Ontario demand peaks much later in the day as a result of time-of-use (TOU) pricing which drops at 7 PM, but it sure does make one wonder why what is supposed to be an orderly trading market should exhibit such volatility. Is it related to the intermittent nature of wind and solar, the fickleness of consumers, the 1,600 megawatts of imbedded wind and solar generation, intended or unintended market manipulation, or just bad forecasting? Until recently, the only major source of energy traded/offered on the HOEP market was “unregulated” hydro produced by Ontario Power Generation, but that disappeared with the change in government regulation 53/05 (Payments under Section 78.1 of the Act). So, with almost all of Ontario’s generation guaranteed specific pricing under long-term contracts, shouldn’t IESO have the capability to contain volatility in the HOEP? For another example of market volatility, one can compare the value of electricity on March 1, 2014, 2013, 2012 and 2011. Total demand including exports in megawatt hours (MWh) respectively was 448,852 MWh, 444,552 MWh, 450,648 MWh and 450,338 MWh. The difference between the highest March 1st demand and the lowest was 1.2%, but the difference in what the HOEP market valued that production at was 982%. The HOEP for March 1, 2014 valued that day’s total market demand at an average of $249.00/MWh (24.6 cents/kWh) but valued the somewhat higher total market demand of March 1, 2012 at only $23.00/MWh (2.3 cents/kWh). Can the ratepayers of Ontario look forward to more of these strange pricing phenomena that appear with greater frequency, or will the Auditor General take a look to determine what is causing the sudden and potentially damaging inability of IESO to forecast demand and stabilize those price blips? Ontario already has the highest electricity prices in Canada, forecast to head even higher. In my opinion there is no need to speed up the process though bad forecasting. The cost of power for just that hour 18 on December 4th, exceeded the average HOEP price for a 24-hour day in 2013, coming in at over $16 million versus an average of slightly over $10 million for a full 24 hours! Oil prices drop by 40% and every news outlet covers it, but electricity prices in Ontario spike by over 3,000% in just one hour and no one notices. The Auditor General of Ontario’s report, released December 9, 2014, confirmed what many of us have been saying for years: the electricity sector in Ontario is a mess and the Liberals created it! As this writer noted in an article, now four and a half years old, the Ontario Liberals were throwing ratepayer money around hoping some of it would actually create some value. About that time then Minister of Energy, Brad Duguid, referred to me as a “self-appointed guru” on television program. Well, sadly, the guru was right…about everything. While deficit spending in Ontario was increasing our debt to as much as $325 billion (noted in the AG report) by 2017−18 the ruling Liberal government was also slamming ratepayers with additional billions, perhaps missing the obvious conclusion that ratepayers and taxpayers are one and the same! The Christmas pudding delivered by the Wynne-led Liberal Government is full of lumps of coal! Re: Turbines’ Impact On Realty Limited, Dec. 8. This study’s authors were able to use less than 1% of the sales collected for them by the Municipal Property Assessment Corporation, and based their conclusions on just a few dozen properties. Moreover, information on expired listings — properties listed for sale that never sold — was not incorporated into the study. You can’t measure what didn’t happen. Several properties within a kilometre of a wind turbine did sell, over and over (as many as four times in the study period), but this interesting fact was also not investigated. So, you have very few sales, some properties that never sell and some properties that change hands multiple times. What was the real story here? Jane Wilson, president, Wind Concerns Ontario, Ottawa. The paper by Vyn and McCullough (2014) should not have been published in its current form as the results are being misinterpreted and highly publicized in the press and in radio broadcasts. The core issue is the lack of power in the statistical tests, a problem partially acknowledged by the authors but then dismissed by their focusing attention on tests for the sensitivity of their model specification. The article appears to encourage the misinterpretation of its statistical findings. Out of the 5414 sales, only 79 post-turbine sales are of properties within a 5 kilometer radius and the rest are within a 50 kilometer radius. The diversity of the houses in the sample is very large as indicated by their price range of ten thousand to two million dollars and by the relatively low R-squares (0.57) in the hedonic regressions. Given the small number of properties that may have been adversely affected and the great diversity of properties in the sample, it is not at all surprising that the regressions yield no ‘statistically significant’ results. The shortage of observations on properties close to the turbines cannot be overcome by extensive sensitivity testing of model form. The problem is with the lack of data not with model form and focusing on the form tends to obfuscate the issue. The authors do recognize the data problem: “Unfortunately, there are relatively few observations in the post-turbine periods that are in close proximity to turbines” (p 375) and “Hence, these numbers of observations are likely too few to detect significant effects, which represents a major limitation of this analysis” (p 387). But there are three problems that should have been picked up and corrected through the peer review and editorial decision process. “The empirical results generated by the hedonic models, using three different measures to account for disamenity effects, suggest that these turbines have not impacted the value of surrounding properties” (p 388). This is wrong for two reasons. First they could not discern an impact which is different from not having an impact. Second, they misuse the term ‘value’. If you have a choice between two identical properties, identical in all respects except that one is close to a turbine while the other is not and if you choose the far one, then the turbine has an effect on the value of the property. This hypothetical example tests the paper’s hypothesis using common sense rather than a statistical measure. “The findings of this paper will provide evidence that may help to resolve the controversy that exists in Ontario regarding the impacts of wind turbines on property values” (p 369) and then proceed to do all they can to make a non-finding appear important and repeat the general statement that they found no significant impact. They correctly said in the CBC interview this morning that their study did not find a statistically significant price effect but the public and reporters, not being familiar with statistical terms interpret this as saying that there was no price effect. Not finding a statistically significant impact due to a data shortage does not mean that there was no significant (i.e. important) impact. This distinction was not made clear enough in the paper nor in the follow up interviews and newspaper articles. Third, the reviewers and finally the editors should have insisted on the power of the statistical tests to be calculated and reported. I understand that editors in the major health science journals insist on this as their readers, doctors and other clinicians, are not always aware of statistical fine-points but they need to be fully aware of the qualifications before using the results to change their practice. Given the potential impact a misinterpretation of the findings could generate, the test of the power should be reported even in the abstract. The reader should be told how big an impact would have to be before it can be detected by a statistical test with this number of observations. Had the price of properties near the turbines been 10 percent lower than they actually were, would the model have yielded a statistically significant finding of a price decrease at say the 0.05 probability level? What about a 20 percent decrease, would it have been ‘statistically significant’? Answers to this type of question would have been easy to produce and far more relevant that sensitivity tests of the model form. The paper deals with an important issue that can have serious policy implications affecting the wellbeing of many people. The results can affect the location of wind turbine farms and the compensation claims of affected parties. Incorrect information or interpretations can be very hard to correct. In such cases, it is the journal editors’ responsibility to ensure that results are presented in a manner that, at the very least, does not encourage the misinterpretation of the findings. Looks good to us: move right on in! Wind turbines generally have little effect on the value of nearby properties with possibly isolated exceptions, a recent study of thousands of home and farm sales has found. The surprising findings, published in the Canadian Journal of Agricultural Economics, come amid an already fiery debate over wind farm impacts and appear to contradict widely-held views among turbine critics. The study focused on Ontario’s Melancthon township — home to one of the country’s oldest and largest wind farms — and surrounding areas. 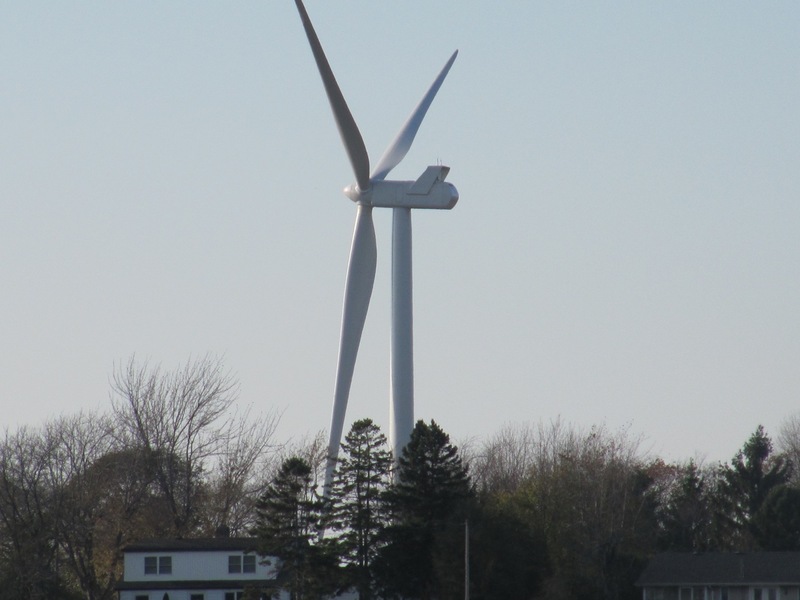 “The lack of significant effects of the Melancthon wind farm is somewhat surprising, given the public outcry regarding the construction of these turbines,” according to the authors. The University of Guelph researchers analyzed more than 7,000 home and farm sales that occurred between 2002 and 2010 in Melancthon Township, which saw 133 turbines put up between 2005 and 2008, and 10 surrounding townships. Of those, more than 1,000 homes and farms were sold more than once, some several times. “These turbines have not impacted the value of surrounding properties,” co-authors Richard Vyn and Ryan McCullough conclude. Vyn said he found the results somewhat surprising given the frequent and public criticisms of turbines. Despite the overall findings, believed to be the first peer reviewed research on this issue in Canada, the study did find some limited support for those who believe wind farms hurt property values. One appraiser’s report found the values of five properties close to turbines — bought and resold by wind farm developers — plunged by more than half, the researchers note. In addition, homes or farms that may not have sold because of nearby turbines don’t show up in the sales data. Several previous studies have also found turbines have little impact, while some others have concluded the opposite. The debate around wind farms in Ontario is becoming increasingly bitter. Opponents, who argue turbines can make nearby residents ill, are waiting for the courts to rule on their constitutional challenge to the approvals process. Dave Launchbury, who has been selling real estate in Melancthon 100 km northwest of Toronto for seven years, said there appears to be a growing stigma attached to properties near turbines. Many potential buyers won’t even look at them, he said. Launchbury estimated properties close to turbines sell for “at least” 10 per cent less. One recent study found that perception around the impacts of turbines might contribute to lower property values. “Assumed property degradation from turbines seems to lower both asking and selling prices,” according to the University of Western Ontario study published late last month. Vyn, a professor with Guelph’s department of food, agricultural and resource economics, said he wanted to extend the research* to other areas of the province and use later data to see if the initial findings hold up — especially given the increasingly vitriolic opposition to turbines. “As people hear more and more about the concerns, I wonder if that will show up in more recent property sales transactions,” Vyn said in an interview.